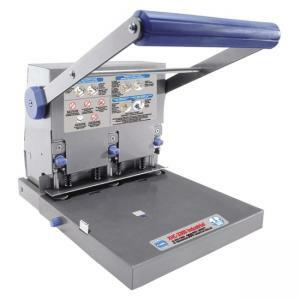 Sturdy, metal punch easily drills standard 9/32" three-hole punch pattern through 300 sheets of 20 lb. bond paper. Hollow punch heads make punching easier. Preset for standard three-ring binders. Featured adjustable margin depth selector and centering guides. Large capacity, easy-to-empty waste tray. Three-hole punch is made of heavy-gauge steel construction.